I think most developers begin to realize that this is NOT how you are actually supposed to debug your programs. There has to be a better way! Well thankfully there is, your browser’s debugging tools. Specifically, I will discuss the Chrome Developer Tools. In this post, I will cover using breakpoints, stepping through your code, setting watch expressions, and applying your fixes in Chrome Developer Tools. We start by executing a series of actions that consistently reproduce the bug. 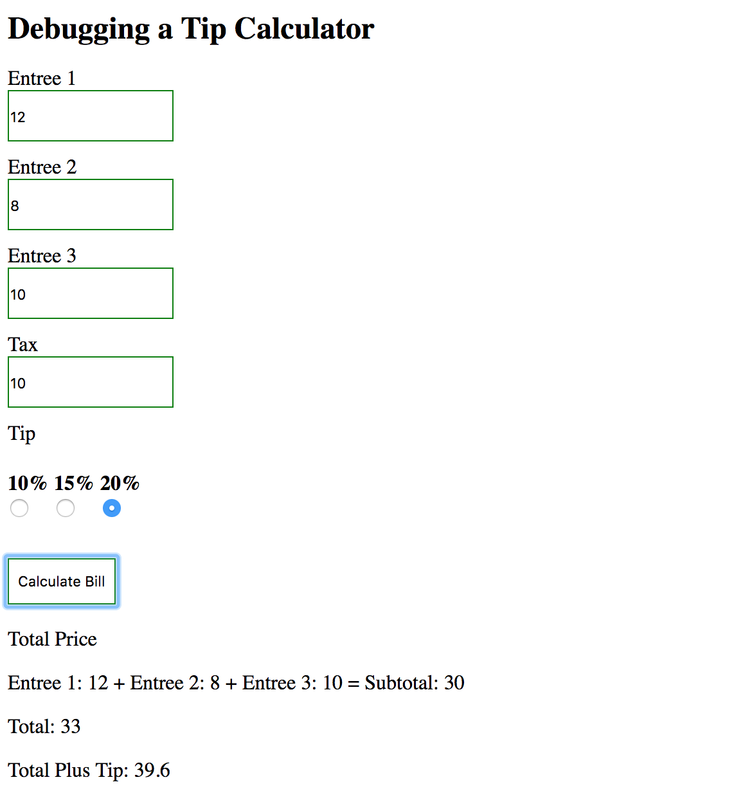 In our case we will be using a buggy tip calculator. If you haven’t opened the sample code. Please do so here. 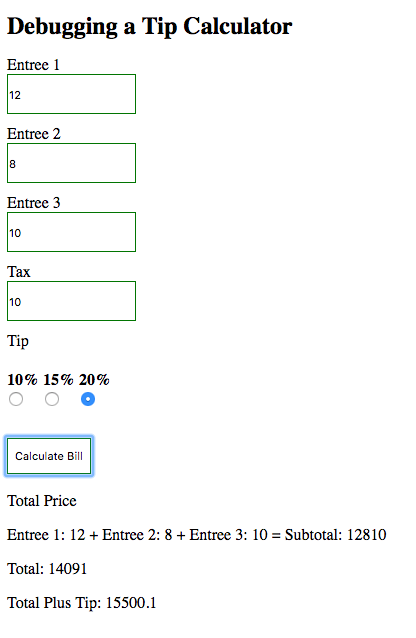 Click Calculate Bill. The total should be 39.6, however we get a much different result. Instead, it appears we have 14105.09…yikes! 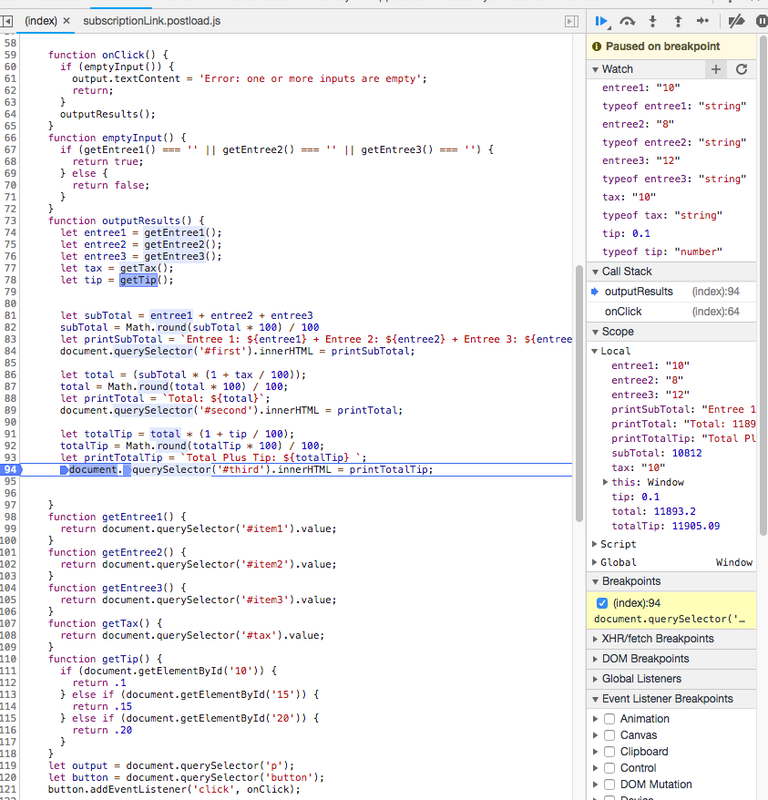 In order to debug this in Chrome, you need to get used to using DevTools. 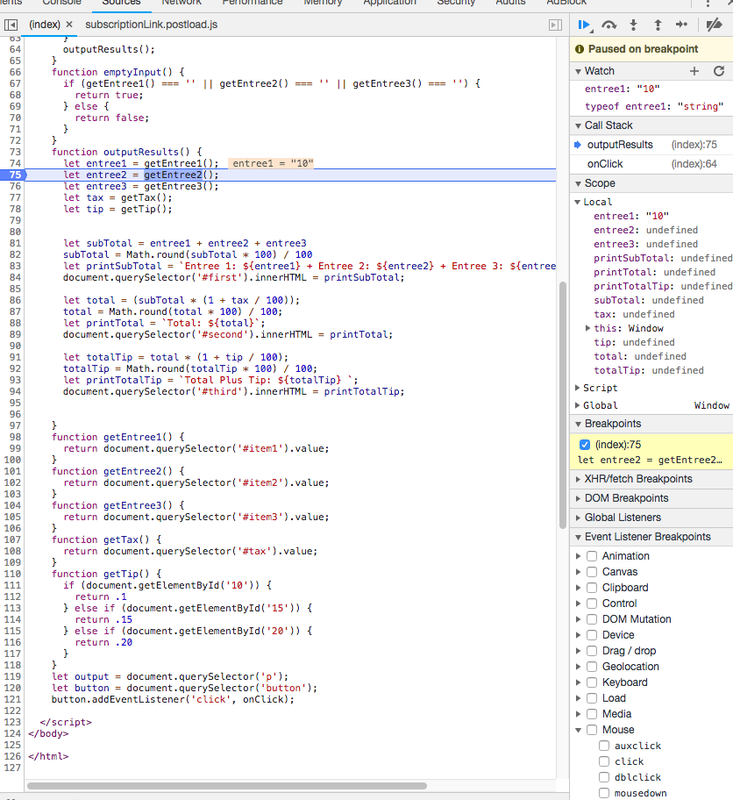 To open Chrome Developer Tools, press Command+Option+I (Mac) or Control+Shift+I (Linux). After clicking on the sources panel at the top, you should have access to three panels for debugging. 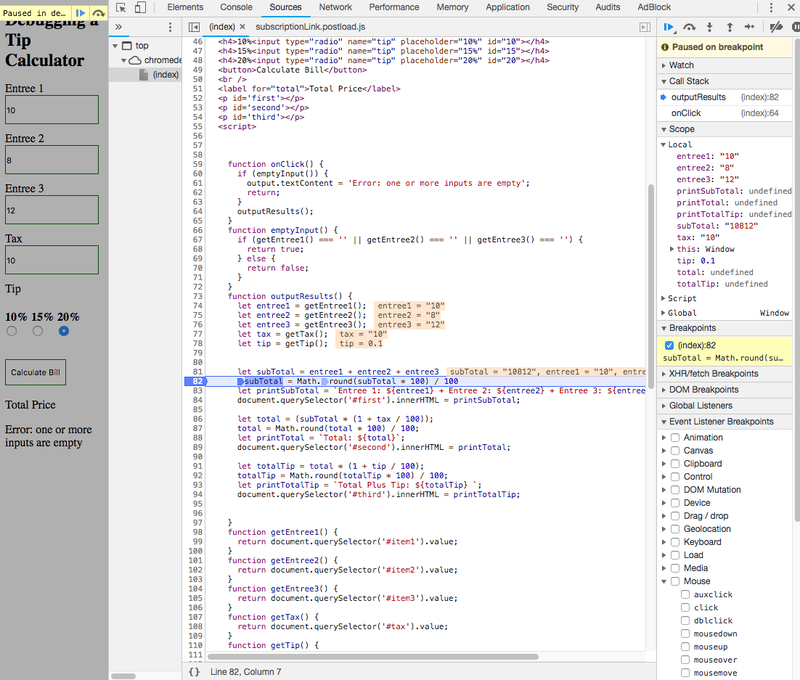 The file navigator, the source code editor, and the debugging pane. Click around and have some fun before moving on to step 3. Luckily, this is no longer necessary with the dev tools in your browser. 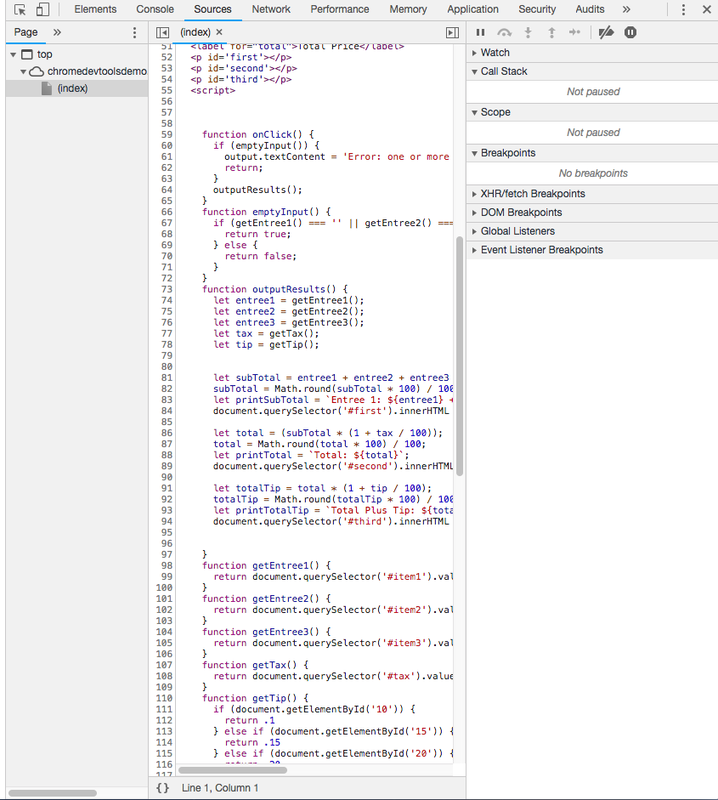 Instead we can simply set a breakpoint and step through our code to find the values as the browser sees it. Let’s talk about how to set a breakpoint. A breakpoint is something that your browser looks for in order to know when to pause execution of your code and allow you the opportunity to debug it. For our purposes, we will be setting a breakpoint at the very beginning of the execution of the program by setting a mouse event. 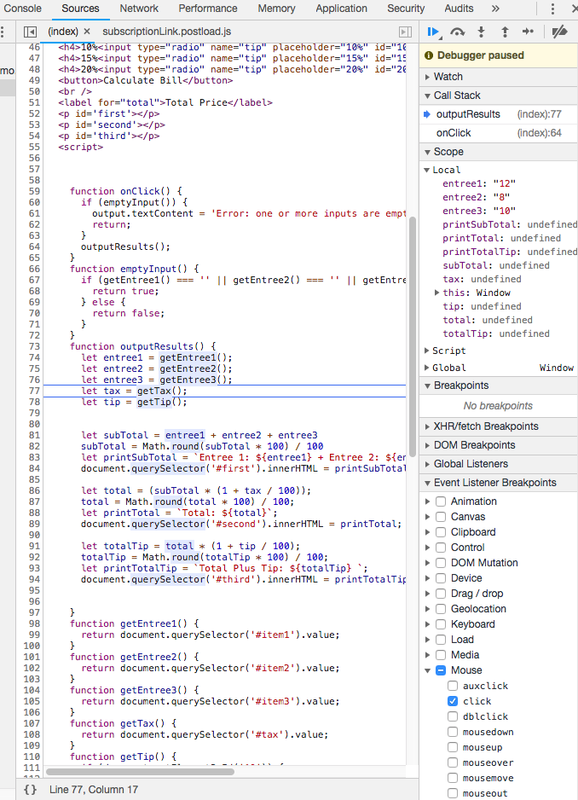 On the debugger pane expand the view of the “Event Listener Breakpoints”. From there, expand “Mouse”. Then checkmark the ‘click’ button. Now when you click the Calculate Bill button, the debugger will pause execution on the first line of the first function “onClick()”. If the debugger is anywhere else, push the play button and the debugger will skip over to it. In all debugging tools, the user has two options with navigation through the execution of the code. The user can either “step into” or “step over” the next function call. Step into will allow for each line of code to executed one by one inside of each function. Step over will allow for skipping over entire functions that are known to be working. Here is an example of me stepping through my code. Under the scope tab, my values for the first three entrees are display on the right. Wow! Being able to step through your code is amazing, but kinda bulky and cumbersome right? Normally, I only want to know the values at certain locations. Well the solution for that problem, is the line-of-code breakpoint. In order to set a line-of-code breakpoint, simply click on the line number that you would like to see more information about. Then run your code as usual and execution will stop on your set line-of-code breakpoint as opposed to needing to step through or over every function. Note: If you are having trouble, make sure you’ve de-selected the click checkbox under mouse. As you can see, my subtotal value is shown as I requested to a value of “10812”. My entree values are also displaying in the scope pane and as an overlay on the code itself. Hmm…I think I may have figured out the bug. String concatenation anyone? Let’s set some watch expressions to make sure though. 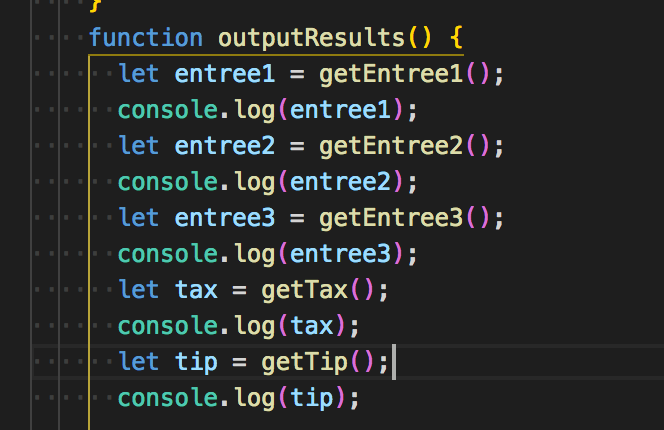 Well now that we know that our entree values are not adding together properly, let’s set a watch expression on each of those values. A watch expression will give more information on any given variable or expression in your code. To define values to ‘watch’, click on the watch pane at the very top and click the + symbol once it opens. Here, you can type in variable names or other expressions. For the demo, I will be setting a watch on my first entree value and the type of that entree value. Aha! I think I’ve found the problem. It appears that my first entree is stored as a string! It seems to be coming from how I acquire the value itself. Perhaps, querySelector() is the culprit. Several other values may be effected as well. Let’s debug further then move into fixing our code in DevTools. Upon further review, querySelector() is definitely the culprit! So how do we fix this? Well we can simply coerce the strings into number values using, for example, Number(getEntree1()) as in line 74. If you are using a workspace, saving the code will be easy and viewable instantly. If not, you will need to save a local copy of the webpage using command+s (mac) or control+s (linux). From there you can open your local copy and view the changes.